3 comments for "Fortune 500 cheats (Thoughts?)" Right on the money Antelope Valley Press! 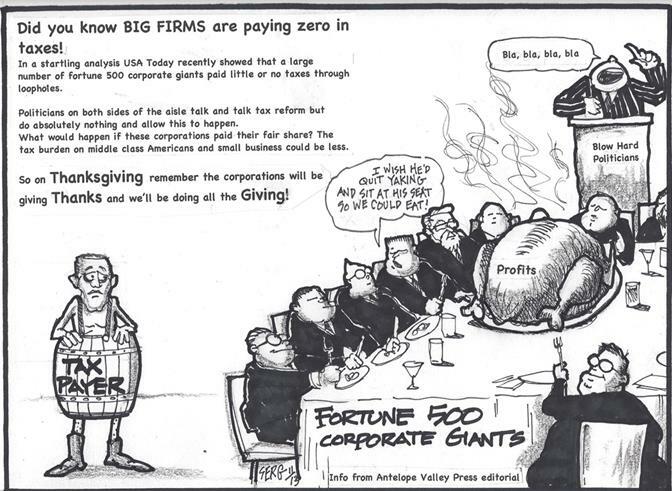 The problem isn’t big companies paying zero taxes but rather the people doing nothing about it. The poor don’t pay Federal Income taxes because they are poor. The rich don’t pay income taxes because they are rich and control the politicians. The corporations do not pay taxes as they contribute to the politicians and political PACs who work for the rich. The politicians would not be elected unless they are beholden to the political parties. Who speaks for the overtaxed middle class?